This weekend saw four players, each representing a different faction, heading into the void! The rules for this OP were all about collecting and maintaining resources whilst battling the opposing force, at the end of each round you either lose a resource, disable an upgrade or take a hit. I've always struggled against multiple attack fighters and wanted to give them a shot myself. I purchased a second Reklar and a second set of 1st Wave Attack Fighters the week before the tournament just to see how they would fare. The first game was against the starter set player from the last OP. No mistakes this time, first game of the day and I was determined to exact vengeance for my defeat in the last tournament. My opponent was running the Maht'Ha, Chang's Bird of Prey and the Korinar, each of the Captains had a high skill, Chang, Kor and I think Martok. Second turn in the Reklar and the two sets of Attack Fighters combined fire and destroyed the Maht'Ha, return fire wiped out Gelnon's Galor. A turn of manouvering and a few shots exchanged, the Reklar managed to finish off the Korinar and Chang's Bird of Prey moved too far past the pack to return fire. So the Bird of Prey was the last ship to fall and the battle was won for the Dominion. The old enemy - the Romulans, a force and a player who I had now faced on a regular basis and going into it I knew he would be prepared for my one-hit-wonder strategy. No photos of this one - was too busy concentrating on staying alive! Romulan fleet consisted of the IRW Valdore, a generic Valdore, the Haakona and the Prototype. Placement was key for this one and I did my usual "keep them all together" line, whilst my opponent spread his forces out, the Prototype in one corner, the D'Deridex in the middle and the two Valdores in the other corner. Immediately I knew that part of my plan had gone out the window - you can only pull the same trick a certain number of times before people get wise to it and my opponent had been burned once before. This turned out to be a very scrappy game, with all ships throwing their all in to each attack. The first thing I had to do was get rid of Salatrel - Gelnon moved in close and used Madred's fleet action to remove her from play, I could not afford to let the Romulans fire first. Gelnon's Galor was first to fall, combined fire from the Valdores and Haakona tearing through it. The generic Valdore was next, combined fire from the Reklar and the Hideki squadron doing enough damage to finish it off. The turns from there on consisted of each ship doing small amounts of damage to each other, slowly whittling away shield and hull points form each other. As the last turn was called, the Reklar managed to destroy the Haakona and the Prototype managed to drop the 1st wave attack fighters to their last hull point. Unfortunately due to the effects of the void, that last shot on the attack fighters spelled their doom, and they were destroyed. A noble effort by both fleets, the victory was determined in the end by the resource tokens, for me a very narrow loss, only 12 points seperated the two fleets. The Enterprise-D, the Equinox and... Voyager. Turn one: each ship moved toward each other, collecting the resources along the way. In the second turn, both fleets moved into point blank range of each other. My hatred of Voyager led me to do a few things. 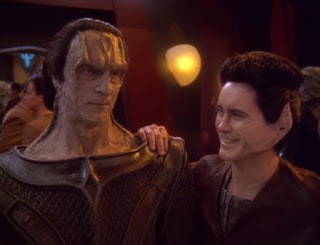 Firstly Madred captured Chakotay and politely asked him how many lights he could see. Chakotay was never seen again. The Voyager was gone, blown away with the first salvo. With its destruction my Voyager curse was over. Return fire from the Equinox and the Enterprise did impressive damage to the Reklar, disposing of its shields and doing a point of hull damage to it. The next turn of manouvering would be critical, I knew that I had to stay in front of the Federation fleet - if they got behind me it would take forever for me to turn around. Dials were set and the movements were made. Every single ship moved forward one. The two battle lines converged, Gelnon used his action to roll two attack dice at the Equinox, scoring one hit and gaining a battlestations action. The Reklar attacked the Enterprise, eliminating its shields. The 1st wave attack fighters stuck next and managed to destroy the Enterprise. The Hidekis fired at the Equinox damaging it further. The Equinox fired back at the Reklar, damaging it again but not quite enough to destroy it. A quick, brutal game landing me a hefty score and a second win. Over on the other table, the Klingons and the Romulans were involved in a very bloody affair, each turn seemed to bring with it a new casualty. Shortly before time would have been called, the Maht'Ha managed to destroy the Prototype for the win. All in all, a very hard fought tournament. It saw the Federation player win his first battle and against a tough Klingon opponent at that. It saw the Romulans take a victory in our ongoing war. Ultimately, it took a Klingon victory over the Romulans to give the Dominion a second tournament win. I think that, for now at least, the time of the Dominion is at an end. Better for them to go out on a high note, than allow decline to set in. One day the gateway to the Gamma Quadrant will open again.